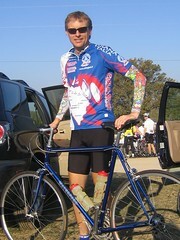 Saturday was the 2007 Spokes ‘n Spurs bike ride in the Liberty Hill area. I did the 60 miler with Kem and Jim Moore. It was ideal weather for cycling. The Spokes ‘n Spurs ride is a benefit ride for the Spirit Reins ranch and was really well attended. The route takes you from near Liberty Hill to Burnet and is quite nice. Not really all that hilly. Just rolling and pretty countryside. Excellent rest stops with great snacks. Better than average, that is. In general, it’s a well run event. Would loved to have done a ‘recovery’ ride on Sunday but it’s been off and on rain most of the day. More on than off in the afternoon and this evening. Hope you’ll join us again this year!